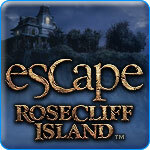 Escape Rosecliff Island Game - Download and Play Free Version! Escape the Creepy Isle by Finding Mysterious Objects in Escape Rosecliff Island! After an unexpected and nasty storm, you find yourself shipwrecked on a mysterious and remote private island. You'll need all of your searching and problem solving skills if you're ever going to make it off this creepy isle. Explore 25 intriguing locations as you search for a variety of items to aid you in your escape. 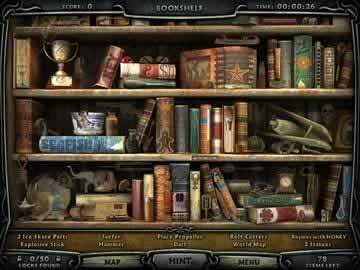 Find over 2100 cleverly hidden items before your time runs out! 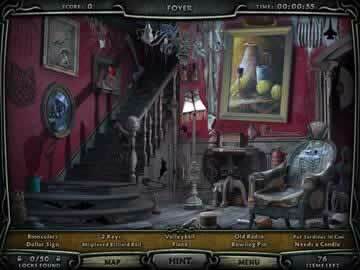 Escape Rosecliff Island presents gameplay elements which fans of hidden object games will find instantly familiar. Experience hours of fun as you search an array of cluttered scenes to find all the items on your list before the time runs. If you ever get stuck you can always use the hint button to find one of the items, and you simply have to wait a set time period before you can use the hint button again. Also, you can find hidden padlocks in each scene which unlock additional game modes, like an Unlimited Seek & Find and a Mystery Bonus Game. Escape Rosecliff Island provides a hidden object experience which gamers of all ages can quickly grasp and play, while adding some extra twists to the traditional gameplay. Besides simply finding a listed item sometimes the word on the list is a clue, such as saying "trunk owner" when you need to find an "elephant". It might also ask you to combine certain items in the scene, like putting eggs into a nest or framing a picture. Additionally, after every few levels players will collect special inventory items by solving a variety of mini-games, such as match-3 puzzles, sliding-tile jigsaw puzzles, and word searches. These interesting activities provide a pleasant diversion from the main gameplay. If you like hidden object games, then download Escape Rosecliff Island and begin your escape today! Catch a glimpse of the hidden object fun you can experience in Escape Rosecliff Island from these gameplay clips.